1.1 This practice covers a preferred method for evaluating the condition of electroplated test panels that have been exposed to corrosive environments for test purposes. It is based on experience in use of the method with standard 10- by 15-cm (4- by 6-in.) panels exposed on standard ASTM racks at outdoor test sites in natural atmospheres. It has been used also for rating similar panels that have been subjected to accelerated tests such as those covered by Practice B117, Method B287, Test Method B368, and Test Method B380. Any modifications needed to adapt the method to rating actual production parts are not considered in this practice. 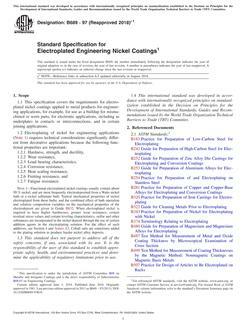 1.2 This practice refers only to decorative-protective coatings that are cathodic to the substrate, typified by nickel/chromium or copper/nickel/chromium on steel or zinc die castings. It is not intended for use with anodic sacrificial coatings such as zinc and cadmium on steel.